Gary Glitter: 'Rock & Roll Part 1' - A staccato, rapped-out piece, with fair excitement as it builds up. Almost a chanting effect. Could do well. What happened with 'Rock & Roll (Part Two)' was I was down in London, just having a social meeting with Gary and he told me he had this record coming out under the name Gary Glitter and he thought it might be a hit. This was released some time around March . Normally if six weeks have gone and the record isn't doing anything, it's dead. So this six weeks came and went, and it wasn't doing anything. All of a sudden Alan Freeman decided to play the b-side on his Pick of the Pops, ages later, and the discos in the country picked up on it. And it started to build and build and build. Around the end of May, beginning of June, we were on tour in England and Gary left a message at my mum's to contact him. He could hardly speak, he was that excited: 'It's going in the charts this week, I need a band for Top of the Pops, will you do it?' We were in mid-tour but I took a couple of nights off, and I went down to London and had a meeting with Mike Leander and Gary. At the time I was involved in writing stuff for records for The Bostons, and so I came to a deal with Mike and Gary that in the fullness of time, after he was established, they would not restrict the band from doing their own records. Which they tried to renege on later; when it came time for 'Angel Face' they tried to back out of it. The first gigs we were doing, they thought Gary Glitter was a name of a band. And poor old Gary there, to be fair, it can't have been easy - he'd got his hit record at last, but it was an instrumental. So he needed a band with a good enough image that could make the thing marketable for the public, that would look right, that would go with the music. And I gave him that. He's probably the only singer that's ever made it on an instrumental. That's the weird thing about it. Because it was the instrumental side that was a hit. 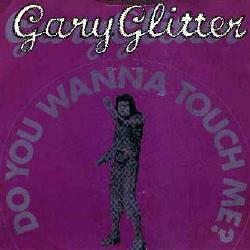 Gary's bit, which he's very good at, is being on stage and being Gary Glitter. Let's be honest, at the end of the day you're not talking about a great singer here; I mean, the recording technique was pretty good and to put it over, you'd give Gary 100% on his public performance - he could put it across, but he had a lot to contend with. Nobody else could have been Gary - I've actually thought about all that. I mean, because of the hits, the ego takes over, but it requires an enormous amount of ego to be that character. Nobody else can come near him as far as ego goes, and to match that whole larger-than-lifeness. It had to be him. It couldn't be anybody else. I think Gary's like a lovable rogue. If other people did the things he does, you'd laugh, but he gets away with it. It's like seeing Dirty Harry films - it's a bit repetitive but you can still sell it because people know what they're going to get. You just know what he'll give you in that hour and a half. He does it so brilliantly well, no one could do it any better, could they? On a personal basis, Mike Leander, Gary and I were very much three mates together, you know what I mean? I met Gary through Mike when I started working for him, and we had a friendship on and off for a long long time. Mike had made records with Gary under various names, and I was involved in most of those. We made a record as Paul Monday, and we made a record with him under the name Rubber Bucket, which was a version of 'Amazing Grace' that I wrote a different lyric to. We used to go around together socially, the three of us, before he broke as Gary Glitter. I'll tell you what it was. Gary was being Elvis, and I was being Colonel Tom Parker. That's the way we saw it. I had him under my wing. Mike was alright, but public school background and all that goes with it, all the attitude that goes with it - very schoolteacher attitude. It was very much like being in the headmaster's study with Mike. If you look at like The Beatles and George Martin, I would imagine their relationship as being very, very stiff. And I think Mike had that sort of knock-on effect, being: I'm in control, I'm in charge. Almost dictatorial, but not quite. He'd open the door a little bit to let you have a little bit of an angle, but he would always have the last say. It would not be democratic and he would not mix by committee. Once you've done the track, that's it, you're gone, they'd mix it. Which I think for that time was right - it's the only way to do it. You have one mind on it. Mike Leander and I went to school together. When he left school, he went and studied law for a few years. I was in advertising, and I didn't see him for a year or two; when I saw him again he was no longer in law, he was working in music publishing, so he went into the business first. First he started as an arranger, then he became a producer, but was always a very, very good writer: all-round he was actually very clever - in terms of pop history, he made an important contribution. 'She's Leaving Home' he arranged, but it's not credited on the album, because he was just so delighted to do it - he got a session fee. He'd done a lot because he worked with Decca: the Stones, Marianne Faithful, Joe Cocker, the list is endless. And while I was still working in advertising we started writing together. We had one fairly big hit with 'Early in the Morning' [for Vanity Fare] and then I left my job and came into the music business. That was 1970. I was very saddened by Mike's death. I didn't realize how much of an influence he was on me, and even now - he's been dead for over a year now - I still don't think he's gone. There is certainly something about his presence that is still there for me. I don't know what it is, but even now if I'm doing something musically and I get stuck, I look up there and I go, 'What's next? What do I do now?' Because he was brilliant in the studio, he was a great arranger, great man for all the harmonies. Very talented man. 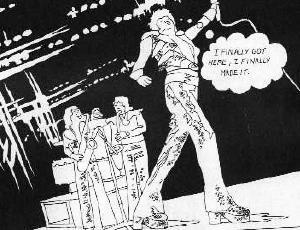 The Glitter Band had the most original sound of an English band, and their stuff was played in clubs as well, cos people could dance to it. Something went wrong there 'cos they should have had a lot more critical acclaim and respect than they got. If they'd done their career right, they would still be around now as a major force. Cos that was a really novel idea, that slide guitar tuning and the big drum sound. The early Gary stuff, it was largely Mike. At that time Gary was in the studio for moral support, but he was out of it for most of the time anyway. Most of that, 'Leader of the Gang' and so on, was probably 95% Mike. He was also a very good musician; he played everything on the Gary Glitter records apart from the brass - he played any keyboard, guitars and drums, there was only brass that might have been added from outside, but otherwise everything you heard on the original Gary Glitter records was Mike. And that sound that everybody tried to copy, that just happened by accident through a little funny old amp that happened to be lying in the studio, but nobody knew that. Because every record after that, people were desperately trying to copy the Gary Glitter drum sound - a distinctive sound on the guitar and on the drums. It was quite a revolutionary concept that people at the time tried to follow. Harvey Ellison and myself were the only guys to play on Gary's records. And if Mike Leander could have played brass, we wouldn't have been on them either. And I can't be fairer than that. He did all the drums in a loop, then added bass, then added guitar bits, then him and Gary did some of the backing vocals, and me and Harvey came along, did the brass bits, did some handclaps with them and beefed up the backing vocals with them. It was all very dramatic and top secret with Mike. We couldn't even get a rough copy of the mix. Although we knew what the song was, the band would get it to rehearse like two days before Top of the Pops, because there was all this espionage bit going on - people nicking ideas. On them records there's two saxes, baritone sax and trombone. The trombone gave it like a hard edge, which linked with the guitar sound because the brass parts were mostly along with the guitar licks, and that mixed together. It used to be a very compressed sound. I was very influenced by Dr John and the whole Afro-rock sound. There was a lot of very good black voodoo rock coming out of New Orleans, and all this music was coming over just as I was trying to turn away from bubblegum and get involved in rhythm and drums. I had my own technique of playing drums, which was very African-based - lots of tom toms - and the sound effects we got on the drums and various other instruments. So it was a combination of my drumming and John Hudson's wizardry on the knobs. 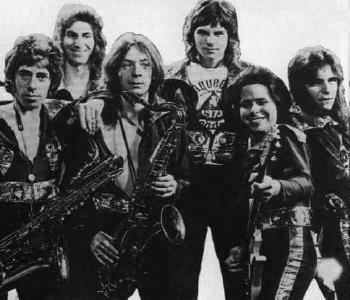 There were four of The Bostons originally in The Glitter Band. There was John White the drummer, Ray Moxley the bass-player, Harvey Ellison, Gerry Shephard and myself. Gary took exception to Ray Moxley so I had to fire him - he peed in Gary's beer while he was onstage and Gary sussed it was him. I'd never seen him before and I think he was doing 'I Didn't Know I Loved You (Till I Saw You Rock & Roll)', the second single. And I looked at him and I thought, 'I don't know about this at all, I really don't know.' Cos I was like the rest of the brigade with grandad t-shirts and flared jeans and all that. Very Free-looking, you know, Paul Rodgers and all that. I heard about four or five bass-players that day and there were better bass-players than John, but what swung it for John was his height. I designed the whole band so I had two big tall drummers and four fairly short guys; so Harvey, Gerry, Springy and me were within about an inch of each other. There was one bloke was about six foot four, and he would have looked ridiculous alongside us. Not to take anything away from John's playing. I actually gave Gary three singles and an album when I first joined, cos I didn't think he was going to last. I thought, this is just like one of those five-minute pop jobs. Shows you how wrong you can be. It felt at the time, and still does, that being Gary's MD was no mean job - the tantrums, you know. I used to get it from Gary: 'You better tell that guitar-player to tune that effing guitar.' And there'd be nothing wrong with it. And I'd get it from the band: 'If that big ... you know, he can get up there on his own.' And Mike Leander: 'John, can't you control the situation.' Terrible, absolutely terrible. So I used to despair of it all. That was one of the reasons I left eventually, because it got too much. see also Are You Ready For Gary Glitter?